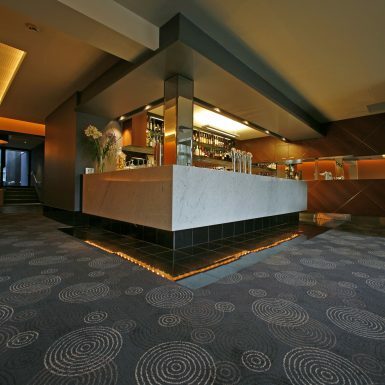 Accommodated within one of Hobart’s most popular waterfront hotels, Vue is a new sophisticated alternative for those seeking a contemporary lounge bar. 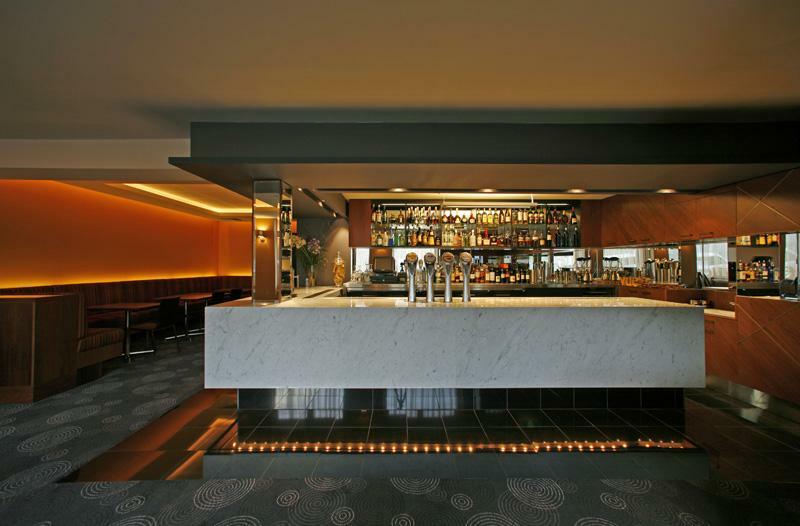 The bar, carved out from redundant space, provides a hidden sanctuary amidst Hobart’s historic waterfront bars. 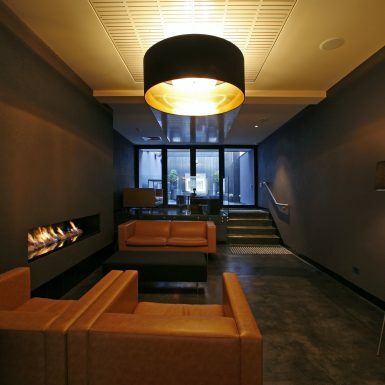 Primarily catering to an evening urbane clientele, Vue provides a series of complimentary spaces, developing traditional materials & objects including stone, wall paper, timber and fire into a contemporary form. 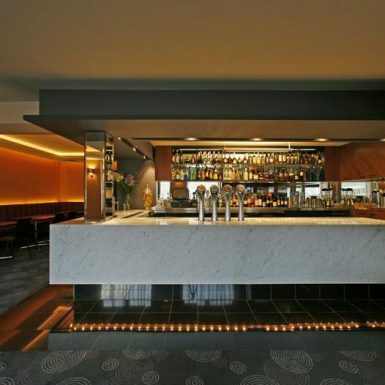 White Carrara Mable forms the sleek low bar floating on gloss black stone tiles, backed by a wall of beveled mirrors and Grey Iron Bark timber veneer joinery. 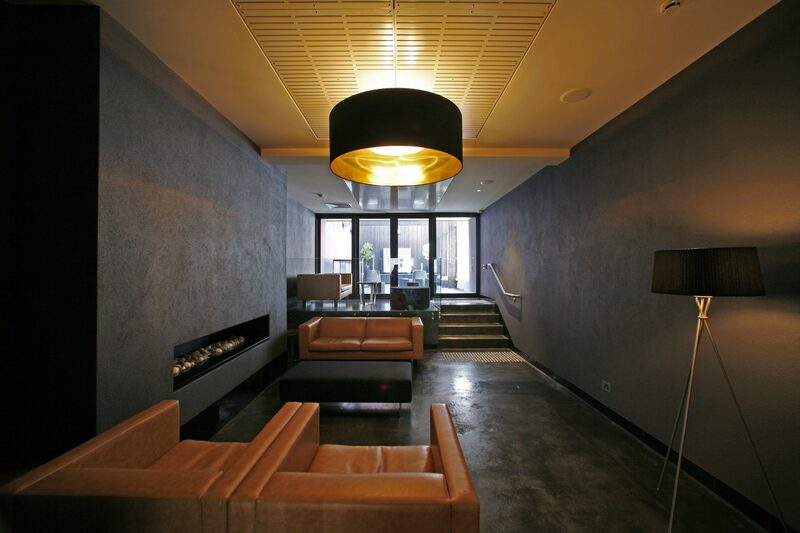 White lighting is used to emphasise the glistening surfaces of this dispensary. The Bar is surrounded by a palette of plush textures and rich colours, incorporating soft coffer lighting, custom made mid height marble tables, leather stools and banquette seating to offer the host’s intimate tapas dining experience. Stepping over the threshold to the lounge beyond, the space transforms. High ceilings & unadorned walls enclose an indoor lounge and external terrace, with timber framed windows & sliding door extending the interior to exterior. 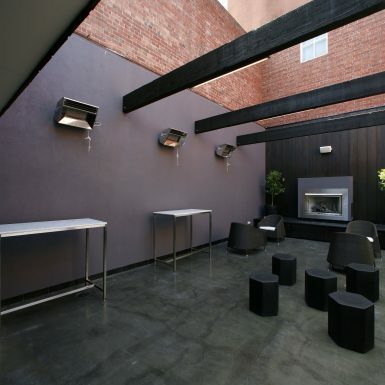 Existing offices to the rear were relocated & the area stripped & opened up to the elements to form the new terrace. The simple, monochromatic textures of render, polished concrete & shiplapped cladding rise to form a long rectangular void amongst the shells of surrounding buildings. Stylish gas fireplaces both inside & out are nestled into the walls and their yellow glow harmonizes the simple forms of lighting. Each of the spaces have a differentiated and modulated character, with a cohesive design palatte. 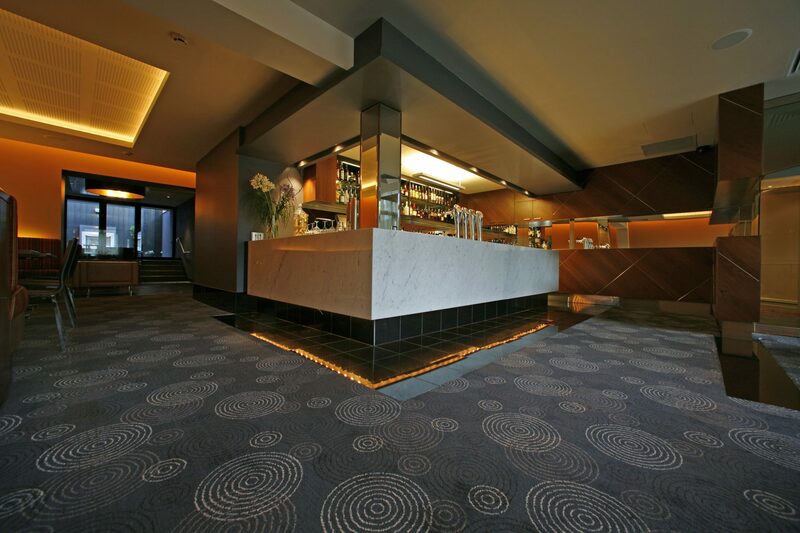 Like a good night out Vue combines elegant urban sophistication with a dry martini. Stepping over the threshold to the lounge beyond ,the space transforms. High ceilings & unadorned walls enclose an indoor lounge and external terrace, with timber framed windows & sliding door extending the interior to exterior. 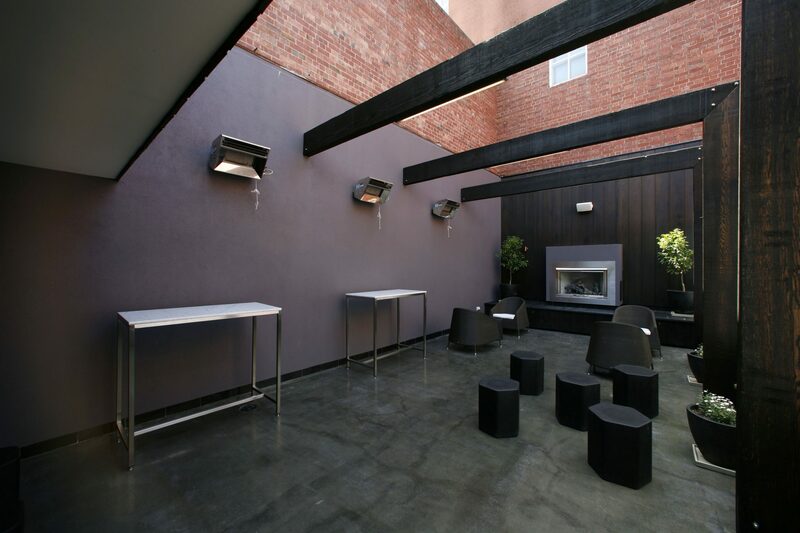 Existing offices to the rear were relocated & the area stripped & opened up to the elements to form the new terrace. The simple, monochromatic textures of render, polished concrete & shiplapped cladding rise to form a long rectangular void amongst the shells of surrounding buildings. 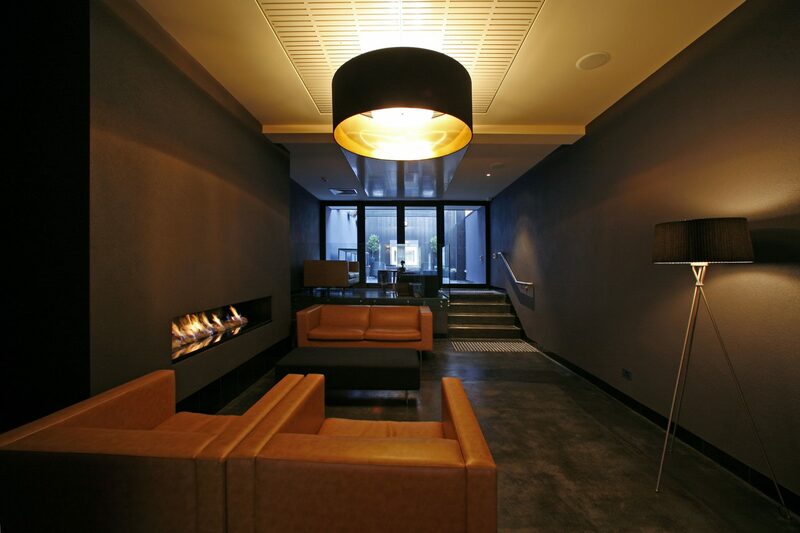 Stylish gas fireplaces both inside & out are nestled into the walls and their yellow glow harmonizes the simple forms of lighting. Each of the spaces have a differentiated and modulated character, with a cohesive design palatte. Like a good night out Vue combines elegant urban sophistication with a dry martini.